Not bad for a Christian. Back in 2006, former American President Jimmy Carter published his 23rd book and set off a media driven, political firestorm. The 2002 Nobel Peace Prize winner’s book concerning the mounting humanitarian and political crisis between Israel and Palestine was simply â€” and controversially â€” titled “Palestine: Peace Not Apartheid”. The title alone ignited the fires of controversy, and over the subsequent months his book tour became a raging blaze of television appearances, confrontation riddled speaking engagements and powerful and thoroughly focused political debate. Along the way director Jonathan Demme filmed it all for his documentary Jimmy Carter: Man from Plains, and managed to construct a stimulating and moving portrait of a true statesman whose belief in Jesus is only rivaled by his impassioned belief in the hope for peace. From the beginning Carter seemed prepared for the controversy. Moreover, he seemed to think it important; an effective option to blast open the doors of debate on what he asserts has become a never ending cycle of violence and an impossible blueprint for peace. The essence of the book is that through erecting walls around the West Bank and in Gaza, Israel is in fact imprisoning an entire people and in its definition, creating a state of Apartheid. His counter argument is especially frank as he discusses his ability to understand why Israel, faced with calls from Hamas and Iran swearing an oath to wipe Israel off the map, might feel compelled to do such a thing. It’s a tricky card to play, and it’s is almost impossible to bring up the topic of Israel and the Middle East without raising shrieks and howls of hate and indignation. Immediately Cater becomes the target of loudmouth political pundits, call in radio hosts and religious zealots who charge that if you sympathize with Palestine you are automatically anti-semitic. But this is an oversimplification of a complex situation that has been building for over 40 years, and Carter’s familiarity with the actual political circumstances, his pragmatic empathy and ground level experience provides a powerful antidote for those who would level charges of hatred and anti-semitism against him. As a former President, Carter’s term in the White House is often categorized as somewhat of a failure, with a series of unfortunately uncontrollable events such as rocketing inflation, a major national oil crisis and then a difficult hostage crisis that saw the kidnapping of 52 American civilians in Iran all conspiring to cast a long shadow over his legacy. But whatever your take is on Carter as President, it is undeniable that Jimmy Carter, the man from Plains, Georgia, was sincerely concerned with taking America in a different direction. 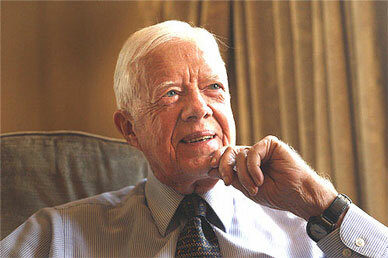 Carter’s effort to eliminate nuclear weapons, his energy conservation concerns as well as his landmark brokering of a Middle East peace agreement between Egypt and Israel in 1979 all signaled a more open and tolerant national agenda, one that would see America defined and bound by a high moral standard instead of simple military might. All of this is revealed through Demme’s patient camera as we follow Carter from airport to car to hotel to his home in Georgia, and through the chronological unfolding of his high profile book signings. Along the way, Demme affords Carter incredible time to articulate his reflections, his concerns and his arguments, revealing a rare and astute compassion from someone who has spent most of his adult life dealing with humanitarian issues, volunteering with Habitat for Humanity and working to bring legitimacy to elections around the world. All of this elevates the film from simple biography to some form of greater exposÃ© that weaves the history of modern American politics, international policy and the difficult journey towards a more humane future as articulated and envisioned by an aging ex-president whose mark on the world can only be seen as coming of age.